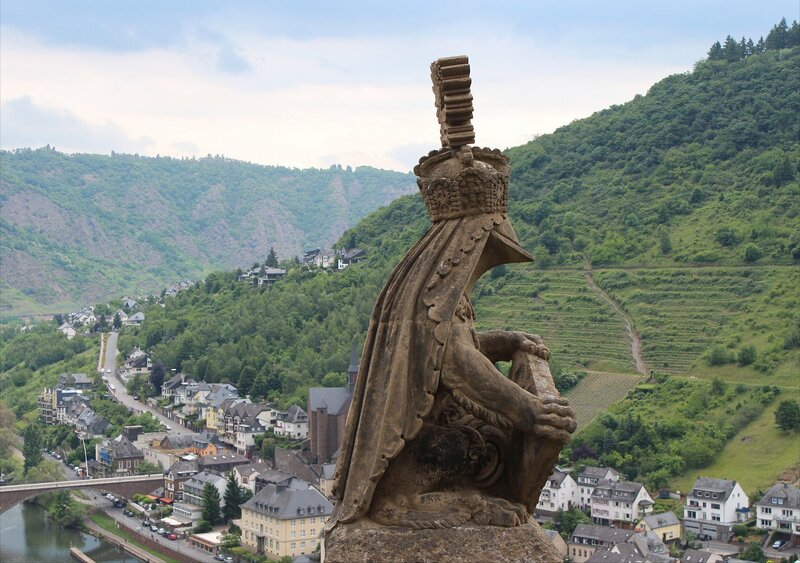 On our first full day of sightseeing in Rheinland-Pfalz we headed down the Mosel to visit two of the castles that are regarded as being amongst the most beautiful in Germany – Burg Eltz and the Reichsburg Cochem. The forecast was not at all promising, offering up an unpalatable choice between heavy rain and thunderstorms but when daylight arrived neither was to be seen. 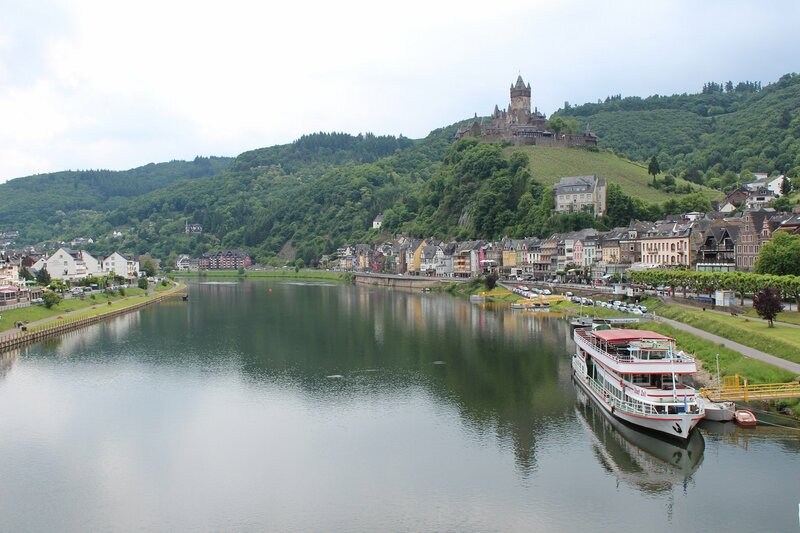 This was most welcome as we didn’t fancy completing the 5km walk from Moselkern station to Burg Eltz in sodden clothes! I started our trip on a marvellous footing, having left the maps of hiking trails on a shelf back in London, but it soon transpired that you really didn’t need them for this particular walk. 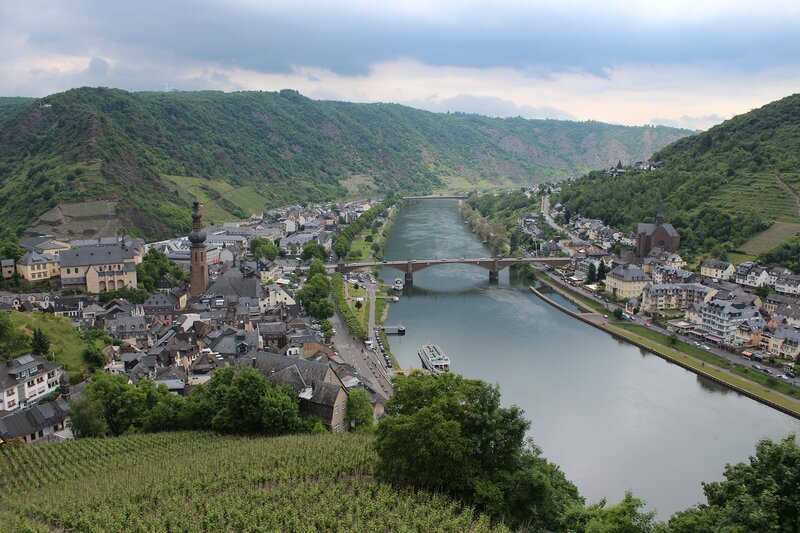 A steady pace along the well signposted path brought us to the foot of Burg Eltz, at the crossing over the Elzbach stream, in exactly 70 minutes. The first sighting of the castle couldn’t fail to impress, even having seen pictures in the guidebooks. The castle is striking from every angle that you observe it – whether from below, from the driveway or from the pathway on the opposite side of the castle. It’s history is equally remarkable – it has stayed in the possession of the same family though its long history and retains many of the features from a fifteenth century rebuild. Only a handful of visitors were waiting when we got up to the entrance, just before opening, but this isn’t a place that remains quiet for long. 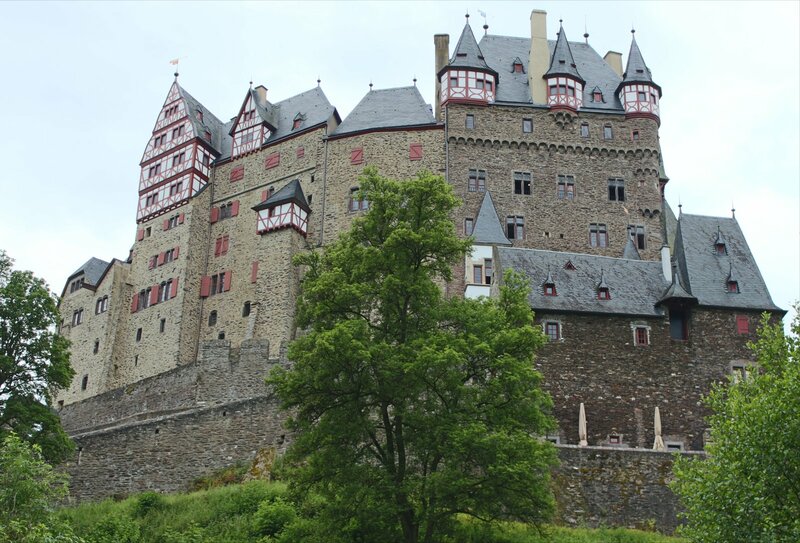 The popularity of the castle inevitably means that tours are run on something of a conveyor belt approach – as soon as each tour had cleared the first room the next one began. Nevertheless, the tour still provided ample time to appreciate the colourful artistry of the murals in the Rübenach Upper Hall and its adjacent dressing room. 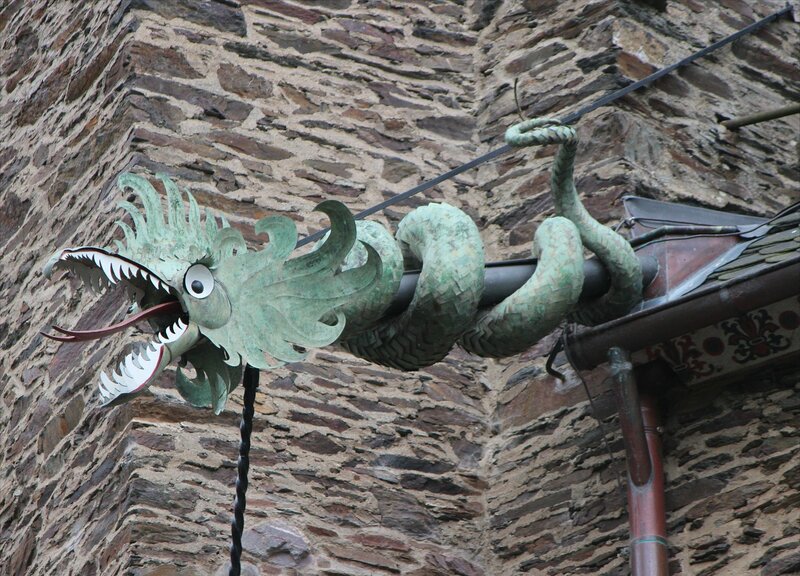 You can see images of the rooms on the tour through the official website at A journey through 850 years in one castle. Our guide told us that family meetings took place in the Knights Hall, which is decorated with jesters’ heads to symbolise freedom of speech and to remind those gathered not to overestimate their own importance. Maybe this is something that should be re-introduced today! 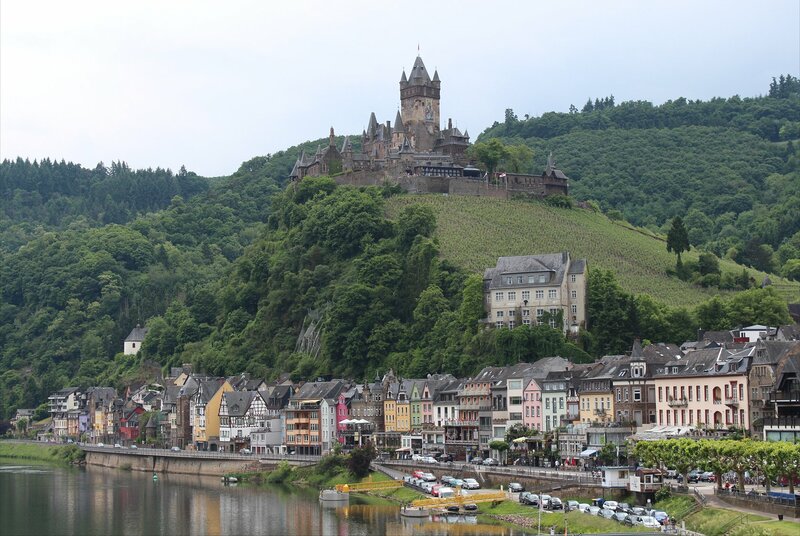 In the afternoon we moved on to Cochem, a few stops down the line, to see a castle that is the complete opposite of Burg Eltz. 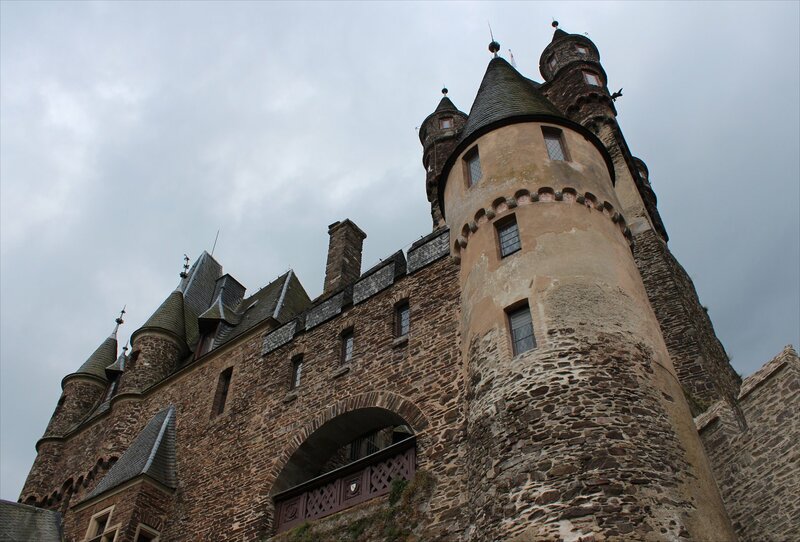 The original castle was almost completely destroyed by the forces of the Sun King (Louis XIV) in 1689 and what you see in front of you is actually a nineteenth century neo-gothic fantasy, the luxurious home of Louis Ravené. 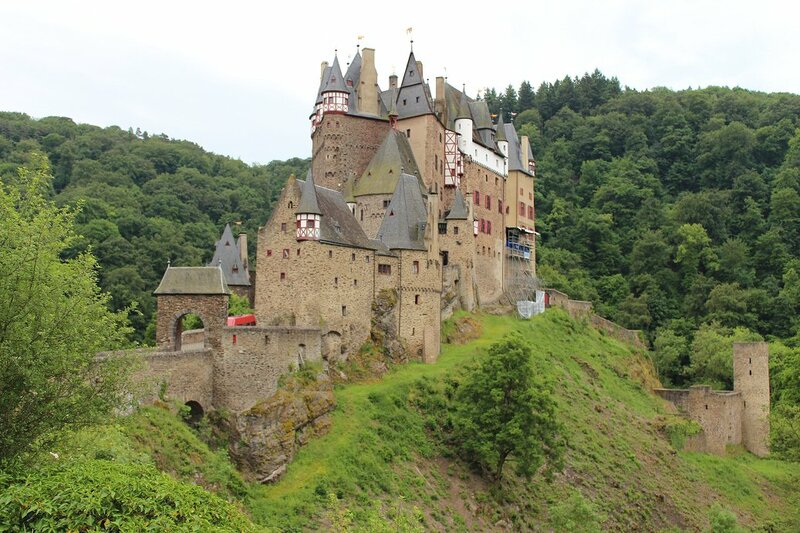 As such, it is a fascinating residence and a wonderful contrast to Burg Eltz. One striking feature noticeable in both the Knights’ Hall and in external decoration was a series of, what could only be described as warrior frogs. Brett took me to task on this, pointing out that they were, of course, lions wearing knight’s helmets with their visors down – assuring me that this was a very accurate representation of what lions look like when they dress up in armour. Who am I to argue with such an authorative voice on the subject!? After completing our day’s quota of castles we made our way back to the station, stopping off at various points along the way. 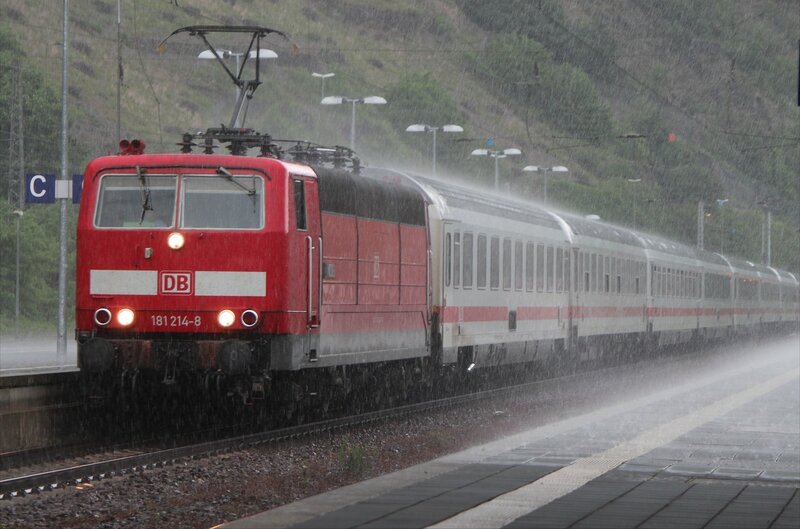 At first our timing seemed to be lousy, with no trains back to Koblenz for forty minutes, but then we noticed a strange grey wall of water down the line, creeping steadily towards us. I’ve never seen heavy rain approach in quite such an orderly fashion. Finally, it was upon us and I was very glad to have been under cover at the station! 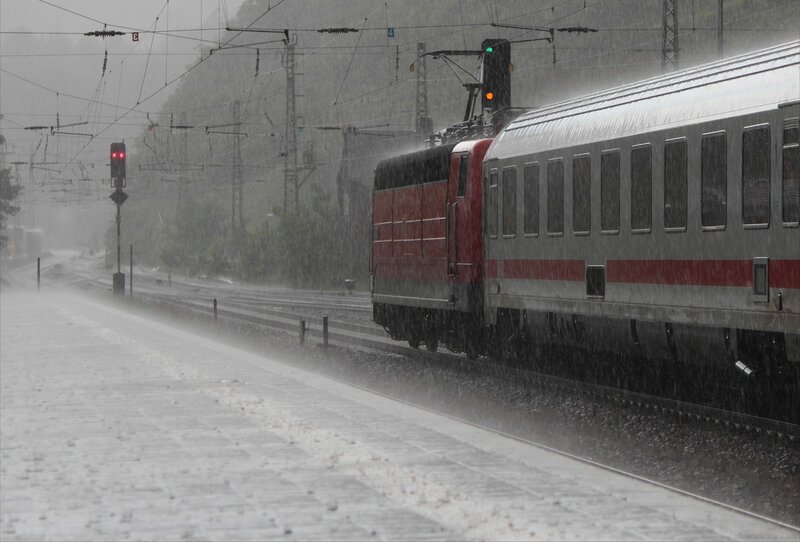 The storm passed relatively quickly and by the time we reached Koblenz you would hardly have known that it had been raining. Nevertheless, we opted for the safety of an inside table at the Koenigsbacher Treff for a good meal and some rather wonderful beer.